Tony Quinn has made a lot of mistakes, like becoming the go to lawyer for the mob. After refusing what would be the equivalent of murder Tony's boss gauges out his eyes. Blinded and depressed he attempts suicide only to be saved by a shadow organization that no offers him a deal he can't refuse, they give Tony a shot at redemption. Now enhanced with cybertronic eyes Tony dons the mask of the Black Bat to right the wrongs of his past and help give his city a better future. 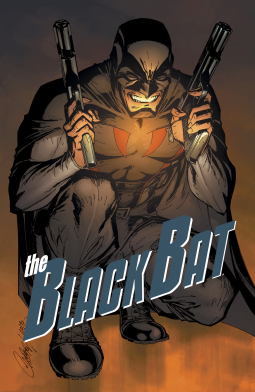 In this revival of the classic pulp action comic, we see the Black Bat revamped for a new audience and let me say bravo. The coloring palette on the illustrations is just right that it conveys all the angst and hopes of our vigilante. While not having the ending I would have wanted these 250+ pages tell a riveting and engaging story that will have you flipping pages like there is no tomorrow.